The number of drivers given penalty points for using mobile phones at the wheel fell by 24% last year in England and Wales, police figures suggest. Figures from 36 forces show the number of drivers given fixed penalty notices fell by more than 40% from 2010-14. Chief Constable Suzette Davenport, lead officer for roads policing, said forces were using different approaches. Last year, Transport Secretary Patrick McLoughlin said motorists caught using mobiles could face tougher punishments. Figures from a Freedom of Information Act request by BBC Radio 5 live show 72,753 fixed penalty notices (FPN) were given out in 2014. Information was requested from the 43 police forces in England and Wales, plus British Transport Police - and 36 provided it. In 2013, 95,941 FPNs were given out for mobile phone offences, while 122,752 were given out in 2010 by the same forces. One force, Staffordshire Police, issued just four fixed penalty notices for mobile phone use last year. The force said it had developed its own programme to deal with motorists - a four-hour "crash course" run by police, fire and victim support officials. By comparison, the Metropolitan Police issued the most FPNs - 22,729 - last year, while Thames Valley Police issued 10,579 - the second highest. Drivers caught using mobile phones at the wheel can be given a fixed penalty notice - which means three penalty points on their licence and a £100 fine. In July last year, Mr McLoughlin said the penalty for motorists could be doubled to six points. However, figures suggest many police forces have offered first-time offenders the chance to attend a road safety course, similar to those devised to deter speeding. More than 99,000 people attended the What's Driving Us? course in 2014 - a 53% increase on the previous year. 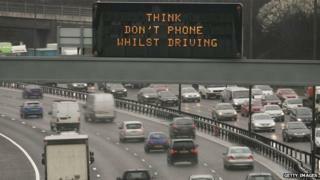 The course is aimed at motorists found to be intentionally breaking the law, including those caught using mobiles. A spokesman for road safety charity Brake said FPN figures could indicate a "decline in policing resources". "We need traffic policing to be made a national priority, so police have the resources to catch and penalise risky multi-tasking drivers, as well as much higher fines to truly deter phone use by drivers," he said. Jayne Willetts, roads policing lead for the Police Federation of England and Wales, also said the decrease could have been caused by a "substantial reduction" in office numbers. Paul Newman, whose sister Ellen died after being hit by a driver using his mobile, said tougher punishments were needed - but warned even that might not be enough to deter drivers. "All the penalty points in the world, it's not going to go away. All the education in the world, it's not going to go away," he said. "I'm scared the figures will make people think they've conquered this - we really haven't." Mr Newman added that he thinks it's a "dangerous message" to send out, saying: "It's a confusing message and we've a long way to go." Jane Allen's 29-year-old son Shaun Worthington died in a car crash moments after sending a text while driving back from a safety awareness course last November. She said: "This use of mobile phone while driving - it's not right. It's certainly not safe. It's not safe for you, it's not safe for other people that are on the road. "Anybody can be wiped out in the blink of an eye. My son has paid the ultimate price with his life. If this can happen to my son, it can happen to anybody out there who is using a mobile phone." Ms Davenport, the National Police Chiefs' Council lead on roads policing, said forces had "a number of options" when dealing with motorists using their phones when driving. "If you are caught doing so, forces will choose what they believe to be the right enforcement action to deter you from doing so again," she said.